Let us review readings in theoretical linguistics. "Linguists sometimes talk of the 'double articulation' (or ‘double structure’) of language; and this phrase is frequently understood mistakenly, to refer to the correlation of the two planes of expression and context. What is meant is that the units on the ‘lower' level of phonology (the sounds of a language) have no function other than that of combining with one another to form the ‘higher' units of grammar (words). It is by virtue of the double structure of the expression-plane that languages are able to represent economically many thousands of different words. For each word may be represented by a different combination of a relatively small set of sounds, just as each of the infinitely large set of natural numbers is distinguished in the normal decimal notation by a different combination of the ten basic digits." page 54. From this distinction between substance and form, springs the school of linguists founded by de Saussure. "Concepts are like chemical compounds, in that they are composed of atoms". This distinction seems quite available to students and scholars in Russia, but not in the United States. In Europe there is a mixed appreciation of this type of stratified thinking. A mistake is typically made in thinking about correlation between atoms and compounds. This specific mistake leads to the class of methods called Latent Semantic Indexing (LSI). LSI is used in text understanding systems. In fact, LSI is often applied to obtain a correlation between words and paragraphs. This is how the matrix in LSI is set up. The mistake treats the atoms and the compounds as having an equivalent "ontological" status, when they in fact do not. The experimental research on the relationships between phonology and semantics has clearly established the fact that form and substance do not have the same ontological status in natural language use. The framework consequent to experimental work on double articulation impacts second language acquisition research, and this research in turn is linked to research on perception and human visual system, including the perception of color. Double articulation presents a challenge to scientific reductionism. Scientific reductionism simply cannot be justified if double articulation is accepted. The reason why it cannot be justified is that form (from which meaning is most directly derived) is simply missing at the level of the substance that fills this form. To account for double articulation, we must move from a simple theory of physical science to a complex theory. Complexity theory postulates that no part of the physical world, or its natural law, can be reduce to a set of token and rules acting on these tokens. Stratification is one way to organize the processes in the physical world into organizational levels. If the physical world is modeled as if stratified then the issue of substance and form can be treated in a new light. If we look from one level of organization it is easy to be confused by what is substance and what is form. From the perspective of the level of expression, the substance BECOMES the form because the atoms from the lower level are subsumed and no longer exist as a thing; at that level of organization. So, as in quantum mechanics, there are things that do not properly exist from the perspective of an organizational stratum. Bell’s theorem (in quantum theory) sets this fact in stone. This stratified theory is not so simple to understand. However, the stratified theory is vital to the development of reasonable ontology apparatus. Success can be found from the performance of stratified machine intelligence. 1) Stratified theory leads directly to a simpler from of Artificial Intelligence (AI) that is radically more powerful when measured using performance metrics. 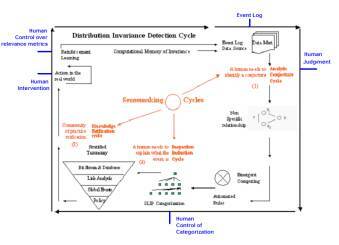 2) Stratified theory separates the now difficult and unsolvable problems in Information Assurance (IA) into a complex part (human motivation) and a simple part (the computer science of invariance detection, event detection and incident management). Using Referential Information Bases, or RIBs, the simple part is completely solvable (conjecture). 3) Stratified theory simplifies all forms of physical science by discarding the centuries old reductionism philosophies. In 2002, Don Mitchell and Paul Prueitt developed the first three OSI Browsers. These browsers applied new principles from computer science, ontology architecture and what one might call Perceptual Knowledge Management. The fourth Browser, generalFrameworks, allowed the development of structured ontology for the purpose of profiling the elements of text collections. (Not completed as of October 2002). Perceptual Knowledge Management starts with the notion of a finite state machine and a means by which a human can easily make transforms on this finite state machine. This is the first step toward an Many to Many (M2M) communications device. In addition to opening access to eventChemistry through the OSI Browsers, the Event Browser itself will have a standard export and import process that allows a stratified objectSpace. This import/export provides academia with a primary event chemistry research tool. The objectSpace has two levels of abstractions. One of these levels corresponds to atoms defined by human conjecture regarding the meaning of correlation between data invariance. The elements of invariance are elementary event atoms in event logs. The second level of abstraction corresponds to the emergent computing that resolves a bag of atoms into a pictorial graph (see the logo at the top of this paper). A complete “SenseMaking” environment is shown in Figure 1.